When we hear the word workout, it is usually associated with the gym, heavy gym equipment, treadmills, and weights. What most of us don’t know is that burning fat through workouts cannot only be performed inside the gym, but absolutely anywhere; and not only anywhere, but anytime. Ever thought of exercising to get rid of all those unwanted fats and have a leaner, sexier, and healthier body? Ever wondered what the best exercise would be for you? Whatever form of exercise you choose, you have to make sure that you are comfortable with it, and it will maximize your efforts so that you will really see satisfying effects after a period of time. First, you have to find time for your exercise. Most of us don’t know how to fit in a period of workout in our busy schedules. The truth is, it’s really possible. Exercising for 30 minutes a day, three to four times a week is a fair time for you to keep yourself healthy. Maximize your day by keeping your body moving. When going to work, use a bicycle. Not only is it faster and more economical, cycling is a good cardio exercise, increasing your blood circulation, especially to the brain, making you very fit and active for your work. Make your lunch break productive. Try going for a 30-minute brisk walk or run. This refreshes you for the second half of the day and again, increases your body’s blood circulation, making you more alert and active. This prevents you from being sleepy during work, which usually happens every after lunch. Had an early dismissal from work? Why not try walking home? If you have enough time, you could use the time to burn off extra calories. Walking is also a good cardio exercise, although less intense than jogging. It wouldn’t hurt to exercise at home also. Instead of idling in front of the TV while you’re watching your favorite show, you could try to do simple exercises that you know of just to cool you off from your hard day’s work. If you plan on having an exercise plan that you want to do at home, the best fat-burning exercises would be the aerobic exercises which are 30 minutes or more in duration and those which keep the major muscles of your body moving. 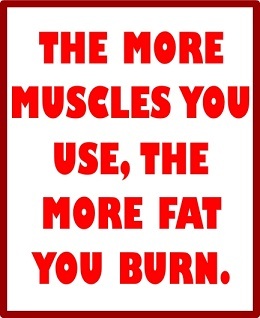 Even so, the more muscles you use in exercising, the more fat you burn. The key trick here is doing the exercises moderately in a long period, and not intensely at one short time. Intense exercise at a short time burns sugars, not fats. Unlike a slow, moderate exercise over a long period, you burn the fat out of you, even after you already have stopped exercising. To burn fat, you could try walking, jogging, running, cycling or swimming. Decide what type of exercise is best for you. Make sure that you are comfortable with what you choose and that you can endure your plan. This first step is one of the most crucial factor that can affect your compliance to your exercise plan. When you say 30 minutes of workout, do it for 30 minutes. If you can do it for more than that, it’s better. Be sure to sustain the exercise. It would be useless to do your exercise for only 15 minutes. Have an equal amount of rest in between your exercise sessions to give your body a chance to recover. Never exercise on an empty stomach. Load up before you start. A low carb, high protein and low fat meal will do. The low fat will not hurt your present body fat that much, and anyway, you would be burning more of it when you start exercising. The high protein will help in building up more muscle while you exercise, and the carbs will serve as your starting fuel for your exercise. Hypoglycemia, a condition wherein there is a very low amount of sugar in your blood, is very harmful for your body, most especially your brain. The brain uses sugar (in the form of glucose) as its main source of energy, so it is important to keep it nourished while you exercise. Signs of hypoglycemia include cold and clammy skin, blurring of vision, confusion, palpitations, sweating and hunger. As the time passes by and you realize you’ve been doing your exercise regimen for a long time, you will be able to tolerate more intense and longer periods of movement. Don’t take this for granted. Level-up and increase the challenge! You can increase your exercise intensity and duration. You will notice that you can already go up that flight of stairs without stopping to catch your breath. Be sure to couple your exercise plan with a good diet. Exercising without a proper diet is like being married to a bummer. Sooner or later, everything wouldn’t be the way you wanted it to be, and then you would want a divorce. Compliance to your planned exercise and a proper diet won’t fail you in giving you the results that you have been waiting for. If you have the determination and passion to keep yourself healthy and fit, compliance won’t be difficult for you. So start your adventure to a fitter and healthier body! Get a move on, now!